Watford manager Gianfranco Zola has said his side must remain "calm and controlled" in their push to win promotion to the Premier League. Saturday's 2-1 win against Derby County brought the Hornets into second place behind leaders Cardiff, who won 2-1 at Wolves on Sunday afternoon. 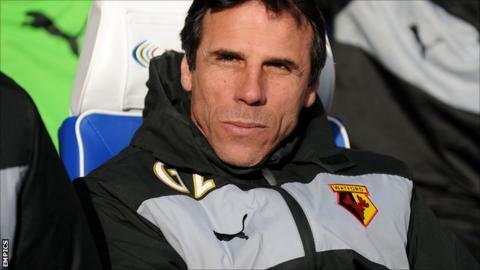 "We have to keep our feet on the ground, we're not elevating ourselves," Zola told BBC Three Counties Radio. "Anything can happen, but we have to be calm and controlled." Zola continued: "We need to keep performing and winning games. "It's essential we keep working on performances and improving things. Today, although it's a good victory, I see things we need to work on." Saturday's success was wrapped up by goals from Matej Vydra and Joel Ekstrand - the former netted his 20th of the campaign. However, Zola was also impressed by the contribution of Alexandre Geijo in attack. "They work very well together and we know how good Vydra is with his finishing," Zola added. "You see Geijo working very hard for the team and he was very good today."